Palermo is known as the city of delights, for it’s beautiful monumental churches, historical palaces, old markets and more. The city has been home of many different cultures during all it’s history and each has left its mark. Palermo is Sicily’s touristic and economic capital, declared Capital of culture 2018. 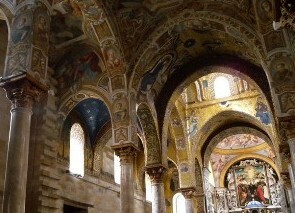 The Palatine Chapel of Palermo is the most beautiful Church in the world according to Guy de Maupassant. It’s located inside the Royal Palace as it was the private chapel of the Norman king Roger the II. This precious jewel is full of splendid Byzantine mosaics, which are considered some of the most beautiful of the whole Sicily. On these mosaics, that cover the walls of the chapel, the figures represent stories about Christ, the Genesis, the Old Testament and the saints Peter and Paul. Unique in the world is also the fine wooden roof that enchants the many visitors of the Palatine Chapel. In the apse, in all its majesty, a big fugure of Christ Pantocrator dominates the scene. An immense heritage unique in the world in history and scientific data is kept in the basement of Palermo. Those who visits the underground cemetery of the Capuchins is preparing to make a trip back in time and space, of course, but especially in a world that, despite the current decay in which it is immersed, is absolutely charming, mysterious and fascinating (though is not for everyone). The Capuchin Catacombs preserve over eight thousand skeletons and mummified bodies of many people, famous and not, which here found rest. The most emblematic case is the mummy of Rosalia Lombardo, a child died of bronchopneumonia in 1920, when she was almost two years old. “The Sleeping Beauty”, so it is called the sweet little girl with blond hair, is rightly considered by many scholars, the most beautiful mummy in the world. Situated over the piazza Bellini, in the middle of Palermo, the church of Santa Maria dell’Ammiraglio is also known as La Martorana, in memory of Goffredo and Eloisa de Marturano, the founders of the nearby Benedictine convent. The church was built in 1143-1185 by the Greek admiral George of Antioch, who wanted to thank the Virgin Mary for her help and protection. George himself decided to assign the church to the Greek-Byzantine clergy who still officiates the ceremonies in ancient Greek or Albanian language (in fact the church belongs to the Eparchy of Piana degli Albanesi of the Italo-Albanian Catholic Church). Because of its richness, the Martorana was visited, in the late 12th century, by the Arab traveller Ibn Jubayr, who left a detailed description of the church, defined as “the most beautiful monument in the world”. However the interiors has been partly changed during the baroque period, which enlarged the church and enriched it with marble stuccoes and enamel decorations. This created a unique combination between Norman features and later styles which is still visible inside the church. But the most beautiful treasure of Santa Maria dell’Ammiraglio is the majestic mosaic decorations, made by Byzantine artists around 1151. The composition starts from the Christ situated on the dome and continues with circles of angels and saints which fill all the church. The walls display two mosaics depicting King Roger II receiving the crown of Sicily from Jesus and, on the other side of the aisle, George of Antioch at the feet of the Virgin. The depiction of Roger is the only known portrait of the king. The newer part of the church is constituted by the nuns’ choir, built in the late 16th century and decorated with precious frescos and paintings attributed to the Flemish painter Guglielmo Borremans. 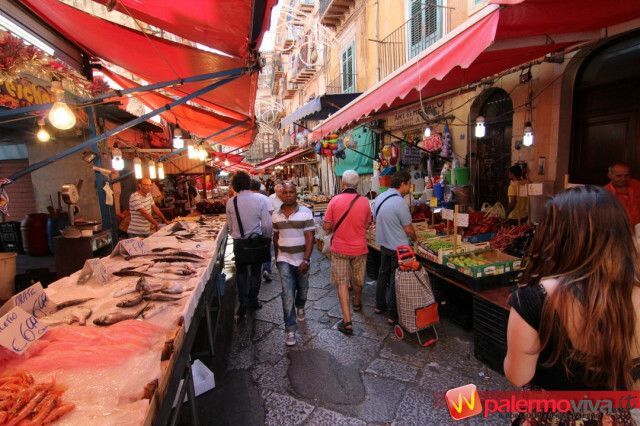 Ballarò is one of the most ancient open-air markets in Palermo (about 1000 years old), and it’s used to sell fruits, vegetables, meat, fish and house items. Its structure reminds us an Arab “suk”, with the stalls and the small shops located next to each other and the goods displayed on tables along the street. In this colorful market, old and new cultures coexist, and the traditional Sicilian goods of the market are being replaced by new shops of Asian and African goods. This is perfectly normal in a Ballarò that transformed its cultural and commercial aspect and which now represents the best example of a new multiethnic Palermo. Located in the heart of the Albergheria, Ballarò takes its name from the small village of Bahlara (near to Monreale), where the Arabian merchants came from. From this place, no longer existing, this merchants used to buy the goods that were then sold at the market. Before 16th Century, this area was crossed by a river called Kemonia, or bad weather River, because it often overflowed and flooded the surrounding area. To avoid this problem, the Sicilian government decided to divert the water into an underground channel and the oldriver bed became part of the city. Walking through the market it’s impossible not to notice the crowded bunch of different colours, smells and noises. The stalls are designed to better display the goods and sellers “abbannìano” (declaim their merchandise) to attract customers. In this particular place, in the middle of this Arab-like market, it’s possible to buy some of the typical Sicilian street food, somethingthat’s definitely worth trying.